Duolinguo is a free language-learning platform that includes a language-learning app along with a crowdsourced text translation platform, and a language proficiency assessment center. Duolingo is ad-free and users are not charged for its services. The language-learning app offers over 40 different language courses across 23 languages, and is available on the Web, iOS, Android and Windows Phone 8.1 platforms with over 100 million registered users across the world. Busuu is a crowd sourcing (social network) for learning languages. It is based on a freemium business model. The website provides learning units for twelve languages: English, Spanish, French, German, Italian, Portuguese (Brazil), Russian, Polish, Turkish, Arabic, Japanese and Chinese. Users select one or more of these languages and work through the self-paced units. Available on itunes as an app as well as on Google Play for Android devices. 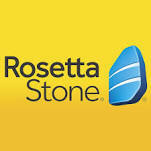 Rosetta stone is one of the oldest and well known language learning software. It can be accessed through membership at the Kent Free Library. Mango Languages is an online language learning system teaching practical conversation skills for real communication." --Publisher advertising. Designed to give users comprehensive conversational language and grammar skills. The basic course (10 lessons) focuses on polite greetings and small talk and is perfect for patrons who are planning a short trip to a foreign country, or for those who want to get a taste of a foreign language and culture. The complete course (100 lessons) is designed for patrons who already know the basics of a culture and a language, and want to increase their vocabulary, improve grammar and speak more fluently. Each course integrates the comprehensive Intuitive Language Construction Methodology, with intuitive content structure and imagery, making it easy to learn and fun to use. Features include: integrated, interactive translation tool; personalized usage tracker; voice recording and comparison tool. Access is restricted to subscribers. You may access the Mango Languages e-database through your public library- e.g. the Cuyahoga County Public Library using your membership card. You may also download the Mango Languages app on the itunes store for Apple devices. A version for Android devices is also available on Google Play. Pangaea Learning is available as a Web App as well as iPhone and iPad apps. Teaches vocabulary, phrases, pronunciation as well as grammar concepts. Choose from over 10 languages. According to their website : " Designed especially for students and tourists as well as business and medical professionals." The English module contains 114 lessons, includes more than 3,000 vocabulary words and has quizzing features. Transparent Language Online (formerly BYKI) is a language learning system that uses flashcards to help you master vocabulary in another language. According to their website, Transparent language learning uses " research-based and experience-driven methodology designed to help adult learners quickly and clearly master a new language."